"The task of producing a cpr-themed cover version is left up to you, gentle readers, talented readers, readers who have discovered that if you hover your mouse over comics on the internet, sometimes they tell you to do stuff." Text that shows up as a tooltip when you hover the mouse cursor over an image — or other elements on a page, even text — also known (more accurately) as "title text". Alt text has many uses; some Webcomics use it to display comments, credits, or additional punchlines. TV Tropes does have Alt Text capabilities, in the form of the Pot Hole. Finishing a lengthy Archive Binge, only to find out you missed all the funny alt text, is something that hopefully will never happen to you. Alt text is inserted by defining the "title=" attribute of the image in the webpage's html or xhtml document. The actual "alt=" attribute has other purposes, though older versions of Internet Explorer would still display it as a tooltip, leading many authors to create alt text only functional in it. Firefox 2 tended to truncate the displayed alt text, although there's a plugin for that. This was fixed in Firefox 3.6. Achewood added alt-text in fairly early in its run. Chirault starts using alt text at some point, but it's usually not really funny or interesting. The Comic Adventures of Left & Right: Inserted retroactively as of September 2010. Dear Children has alternate text on many of its pages, and they are almost always humorous. Dinosaur Comics has an additional punchline in the alt text, as with the comic's archive name and email subject. The End has started running stories in the alt text. Chapter 15 told the story of a studio team making a movie tangentally similar to the chapter. Chapter 16 does something similar to old pulp sci-fi novels. Existential Comics has alt-text on most (but not all) comics, typically a second punchline. More "serious" comics, the early issues, and some at random don't. Humorous is also provided for most of the philosophers listed at the bottom of the page — clicking on their names leads to a page listing every mention of the philosopher in the comic. Furry Experience adds alt-text starting on Thursday 17 December 2009, though it's done about half the time, while the rest go alt-text-less. It's usually included to add something without the characters Breaking the Fourth Wall. Imprint Chronicles has alt text which is often the 'biggest' sound effect on the page, or a very short comment on a character or panel. Author David Morgan-Mar argues against them in this strip, a parody of xkcd. While using it anyway, because he's parodying xkcd, and wants to get it right. 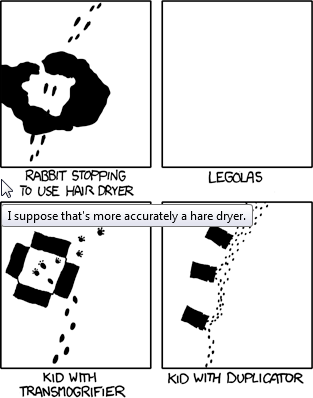 His previous xkcd parody featured a Take That! against alt text in the alt text, which read "Some text that's too long to display when you mouseover it in Firefox, thus forcing you to check the source code to see it". Which, of course, shows up as "Some text that's too long to display when you mouseover it in Firefox, thus forcing you to..."
Oglaf initially didn't utilize alt text as bonus info, but progressed to use alt text and later on to simultaneously using different ALT and TITLE text, making some people having to not only hover their mouse over the image but also look up the alt text in the source of the page. xkcd alt text is perhaps the most famous of the "extra punchline" genre; read the comments on the above fix for Firefox 2, and you'll find xkcd readers seem to be its primary market. The What If? spin-off blog initially didn't have any, although this changed soon after. Initially all the tooltips were simple descriptions of the images (but still using title= instead of alt=), but gradually between "Tie Vote" and "Steak Drop" , they, too, became extra punchlines. The Adventures of Dr. McNinja has done this since the So What Is a McNinja issue, mostly for another joke or some commentary on the strip. Woo Hoo! has additional punchline alt-text on every page. In Koan of the Day, a last thought is always given in the hover-text. OAFEnet reviews begin with straightforward alt text naming the subject of the review, then quickly degenerate into name-calling, in-jokes and even running gags. Yes, alt text-only running gags. While it is, perhaps, not exactly this trope, Narbonic features hidden text in the file name of each strip: a word or words that, when placed in order by date, form a side story. HERO, all the text (except one chapter, for stylistic reasons) is in Alt Text. Dialogue, narration, everything. Three Summers Strong warns the user that there are Alt Texts in its slogan, so that the reader knows they are part of the joke. Molten Blade makes frequent use of title tags to include references and comments in strips that are otherwise intended to be serious. The first few years didn't have votey comics, but the author starting going back and adding them. Several are about how he doesn't get the joke he wrote over ten years ago. In 2015 or so, it gained alt texts as well, which sometimes contain a joke but sometimes just name the comic. Thinkgeek, being a geeky store, used to hide little jokes in the thumbnails on the gallery pages. They've stopped doing that, though. Suppression has some truly great Alt Text, such as here and here . Something*Positive has little comments similar to alt text printed in plain sight at the bottom of the comics. So does ImprintChronicles , with snarky comments left by the creator. The Noordegraaf Files: All the pages have it. Sometimes it's a joke, sometimes a reference, and sometimes it's just commentary. Knights Errant frequently has amusing comments hidden in the alt text. Housepets! often uses the alt text as a secondary punchline for the strip. - How do you see an alt text? - The only appear to those who truly believe. - Those that believe in MOUSE HOVERING. The 300th strip has a 215-word alt text. Wondermark uses its alt text as a secondary punchline, which is sometimes funnier than the first one. TV Tropes, as mentioned earlier. The Word Weary has alt text in every comic. Whether or not it's actually funny. Ever since this strip, Out at Home. - "Hey! Stop reading the mouseover text and look at the comic!" The author does not add alt-text to comics that involve especially long and deep stories, allowing the reader to enjoy the comic as it is. Non-webcomic example: the awards in Quake Live. Encyclopedia Dramatica uses potholes much the same way. The Way of the Metagamer not only has title= text, but has a character to read the title= text. The first presenter was Titular, replaced later on by Ebony Nauss. Skin Deep started adding them from the Exchanges: Heartaches storyline onwards. The Dawn Chapel often uses hovertext for both the comic itself and the accompanying 'stinger' process sketch. Ozy and Millie used mouseover text on the cast page, featuring quotes from the characters. Abstruse Goose has mouseover Alt Text and an alternate title hidden in full text of the image location (found by viewing the image info). On the news site Japanator , Ben Huber's Yotsuba&! comics have alt text. 5 Color Control. The first comic Lampshaded it, with alt text reading, "Sorry, we're not cool enough to do rollover jokes." Selkie sometimes does this, calling it "Secret Director Commentary". Bicycle Boy has Alt Text in almost all comics. Michael Poe's Does Not Play Well With Others, as well as the newer strips in his Errant Story. Down The Stairs features Alt Text in all comics. Miscellaneous Error uses Alt Text for additional punchlines. Paranatural strips usually have Alt Text, though it's absent from some of the earlier pages. Homestuck doesn't ordinarily contain Alt Text (it would be highly impractical for its format), but a few updates starting here incorporate Alt Text in the banners. The Alt Text serves as the Author Avatar's voice while he parades through the banner in a quest to find the guy currently narrating the story and wrestle the narrative back from him. And then, starting here, we get to hear another character's voice for the first time. This is completely terrifying. 2P Start!, although the alt-text only begins mid-way through. Alfdis & Gunnora has Alt Text on every page, usually a commentary on the page or characters, occasionally additional dialogue. The Order of the Stick doesn't have actual Alt Text, but the comic titles often serve the function of the additional punchline, only making sense to the reader after the page in question has been read. The archive binger may be somewhat confounded, however, by the fact that the comic title doesn't display from the comic page itself, though the newest page title is always visible on the sidebar. Comic titles are visible in this archive. Edmund Finneys Quest To Find The Meaning Of Life has a little paintbrush icon under each comic, which displays the alt text in a little widget if you hover your mouse over it. Apparently the alt text is stuff Edmund writes down in his notebook. Gunnerkrigg Court doesn't technically have alt text, but the witty little comments below each comic serve the same purpose, and are just as easy to miss the first time you read it...especially because they don't start showing up until around chapter 5. L's Empire has some where the alt text for multiple pages need to be read in order to get the joke. For a non-webcomic example, some YouTube users like to put an extra joke into their videos' tags, like raocow. Tea House starts using this early in chapter 3. New School Kids has this, though usually only tangibly related to the plot. Happle Tea uses it on occasion. Thornsaddle has alt text for most of its strips, especially the earlier one. The Cutting Room Floor , a wiki covering removed content in video games, often adds a silly joke to the images. Since it's a freely-editable wiki, the humor value varies. The Ask Dr. Eldritch comics includes the added punchline variety. Sidequest Story uses this trope for additional commentary and dialogue for its pages. Axe Cop, starting around comic #84. Almost all Dewey Defeats Tarzan strips have this. APT Comic is currently trying to make sure every one has one. IT-HE Software does this from time to time, often to cram yet another Shout-Out in. MS Paint Masterpieces: Well, sorta. There was never text to begin with (he used filler for that), but then Dave set up Disguntled Ferret's comic with a text function starting on #958 (it is only viewable if the comics are displayed one at a time). Equestrian themed webcomic The Idea of Order not only uses alt text, but also includes an additional punchline in the caption. For the inattentive that means three passes through the archive. Precocious: Used mostly for Lampshade Hanging (especially in regard to lacking backgrounds, Spoof Aesops, and incredibly egregious puns). A variation in Distorted Travesty, which uses Game Maker's ability to change the text in the title bar for each room to provide developer's commentary (or meta jokes) if the game's played in Windowed Mode. Dumbing of Age started having it on February 14th, 2013. The first altext was, appropriately enough, "what i can add HOVERTEXT???" One strip almost a year earlier had hover text added retroactively, as well: "if you've looked through the entire archive looking for hovertext, congratulations, here is some"
Shortpacked! also started doing this. The text on both is often a secondary joke or meta explanations/warnings/information. The header images for abridged scripts at The Editing Room all contain a mean pun on the film's title, the better for you to mock them with. Poppy O'Possum offers a second punchline or some commentary for each page. Girls with Slingshots has them (since #1054), sometimes as a second punchline, other times as an author's note. As of spring of 2014, there is an icon next to the comic navigation links which, when touched on a tablet, will display the alt-text, at long last making them accessible for readers using tablets or other mouseless formats. Princess Chroma has used alt text from the beginning. Biter Comics features hover text either adding to the joke or offering some commentary on the work. Guilded Age uses alt text in every comic, even guest comics. Mostly it's another joke, though for the chapter beginnings it's instead "The one where [something related to the chapter contents]." Whomp! started using alt text for additional jokes (or as the author calls them "Secret Words") in this comic .Prior to this the text only displayed the comics title. The text can also be found by clicking the "Secret Words" button at the bottom of the comic. A Softer World allows you to either view alt text in the traditional way or by clicking on the comic, which causes a window to appear displaying the text. If you view it the traditional way, it may be entertaining for the easily-entertained to find a spot to hover which will cause the alt text to appear in a logical and aesthetically pleasing location respective of the actual comic. Not Enough Rings also uses alt text for additional jokes. Everyday Heroes includes additional punchlines (or commentary, for serious episodes). Lucid Spring uses it, mostly to poke fun at the characters and the writing. Unity is generally a serious, sci-fi/drama comic — except in the alt text. Alice and the Nightmare uses alt text for additional worldbuilding and introducing characters whose names aren't given in text. Cyanide & Happiness doesn't use alt text, but the filenames under which each comic's graphical image is stored often contain hidden messages of their own. For instance, if you look at the comic for 13-July-2007 , and right-click over the comic itself and choose "properties" or "save as", you'll see it has the filename assassinations-are-less-controversial-then-low-income-families.png. We Are The Wyrecats uses alt-texts mainly as a means for the author to provide additional commentary or make dry quips. On the website for Atop the Fourth Wall, alt text appears when you position the cursor over the logo. This includes some running gags ("I AM A MAN! (punch)"), call-backs to his reviews ("Snowflame feels no pain"), and even some Self-Deprecation ("My claim to fame: being punched by The Angry Video Game Nerd once"). A Girl and Her Fed began using these for extra jokes and occasional commentary roughly around when Art Evolution started to hit the comic. The Redac uses it on many pages, mostly for snarky comments or stray thoughts. Beyond Bloom Has them on most pages. Often silly quips, commentary, or extra information. Up until around 2016, every image on Legends of Localization had this. It's particularly impressive here , where even the many tiny sprites near the end of the page have unique alt text. Daughter of the Lilies has one on every page. Often provided by Patrons if they come up with something Meg particularly likes. Corny notes on the first page of Never Satisfied that they're going to use this on every page if it kills them. The alt text is usually used as an additional punchline, but sometimes provides additional background information. Sleepless Domain typically uses alt text for extra jokes. However, the alt text goes away almost entirely during the darker parts of the comic, namely when the Purple One, aka Goops appears on screen.